We managed to pack a lot of fun into our last stop, despite the fact that we only stopped for three full days. 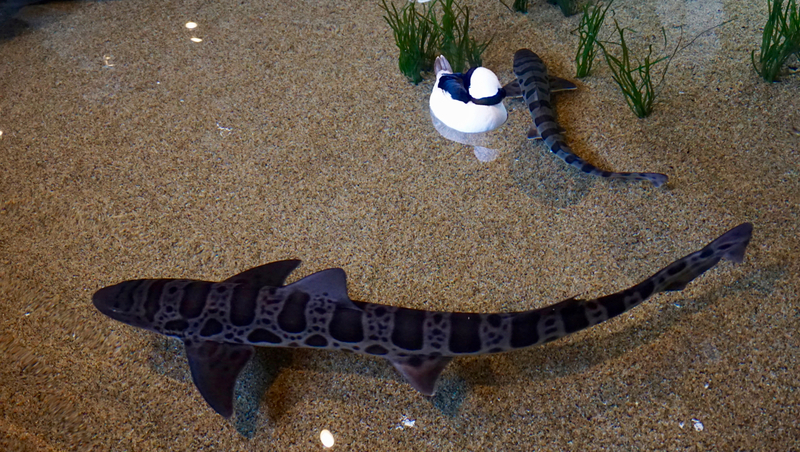 We drove to Monterey, California to visit their world-renowned aquarium (and sea otter exhibit! 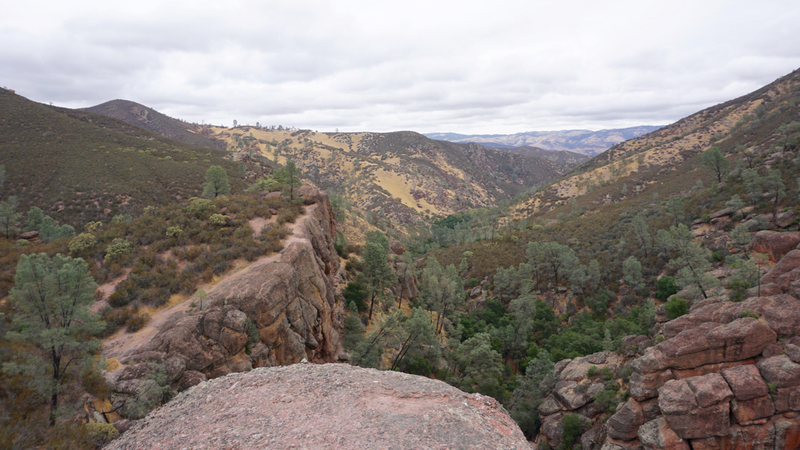 ), went hiking in Pinnacles National Park, and spent a day Jeepin’ at the Hollister Hills State Vehicle Recreation area. 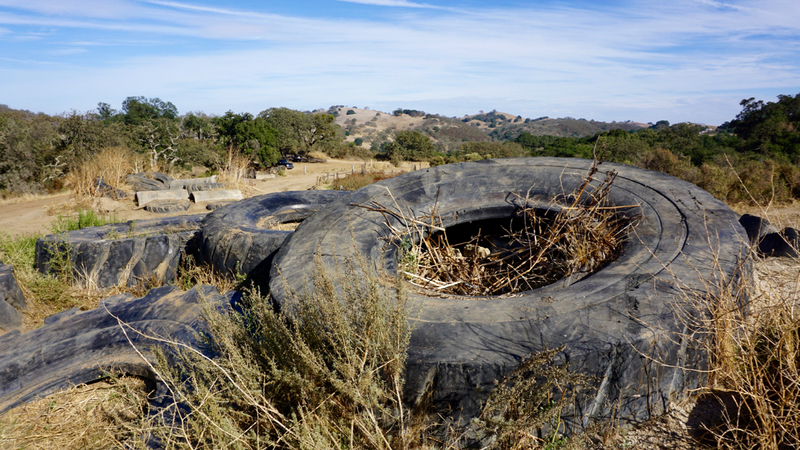 Unfortunately, one of the reasons we stayed so busy was because the campground we stayed at was one of the most depressing campgrounds we’ve seen in a while. Thousand Trails campgrounds have been working out pretty well so far in California, but this one was old, dusty, and badly maintained. The staff was rude, they had water leaks all over the place, and many of the electrical poles were out of service. If we hadn’t been trying to use up our free camping days with Thousand Trails, we probably would have looked for a different spot on day 2. This one was considered a “preserve”, which I guess was cool. There were lots of deer and I saw a bobcat once, but this might have only been because we were in the middle of nowhere. Honestly, the only thing they appeared to be preserving was all the bad decor from the 80’s and 90’s. That also may have been the last time anyone vacuumed the carpet in the lodge. I could go on but there’s no need to beat a dead horse. There are plenty of negative corners of the internet and this is not one of them. On the upside, we did lots of exploring because we prefered to spend the day elsewhere. 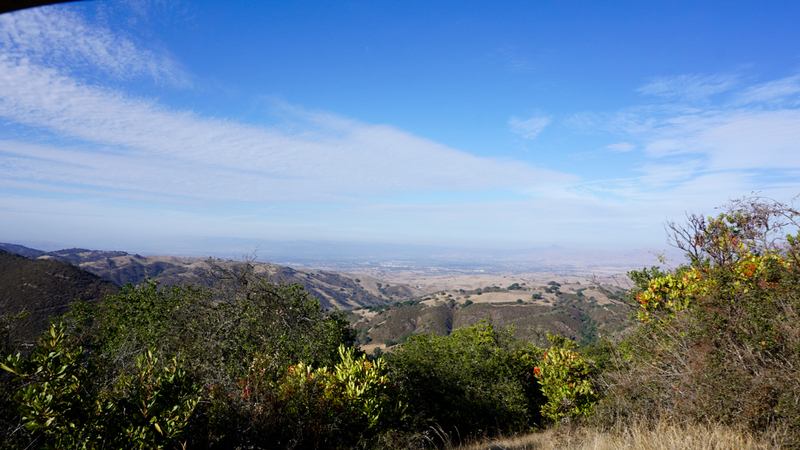 It was a very long drive to and from Monterey (about 1.5 hours) but it was pleasant countryside. And overall, the Thousand Trails membership has been money well spent and a good experience. So far just one bad egg in a very large state. Also, the nearby town of Hollister was small, and run-down in parts, but it had a decent grocery store, the largest independent coffee-shop I’ve ever been in (Mars Hill Coffeehouse), and surprisingly good Chinese food (The Happy Cafe). 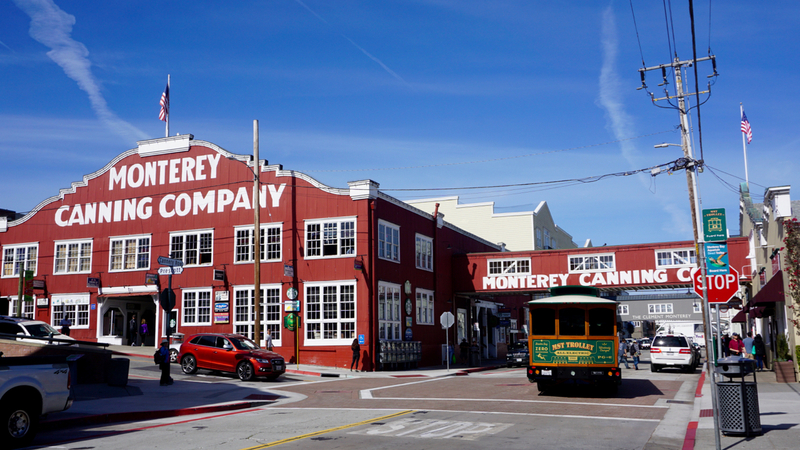 Even though my primary reason for visiting Monterey was to go to the aquarium, we spent some time walking around the touristy boardwalk of Cannery Row, just for good measure. We’ve been to a lot of these touristy boardwalks while traveling down the California coast, but we found this one to be particularly charming. It wasn’t too crowded and it was a beautiful day to people watch and enjoy the crashing waves. 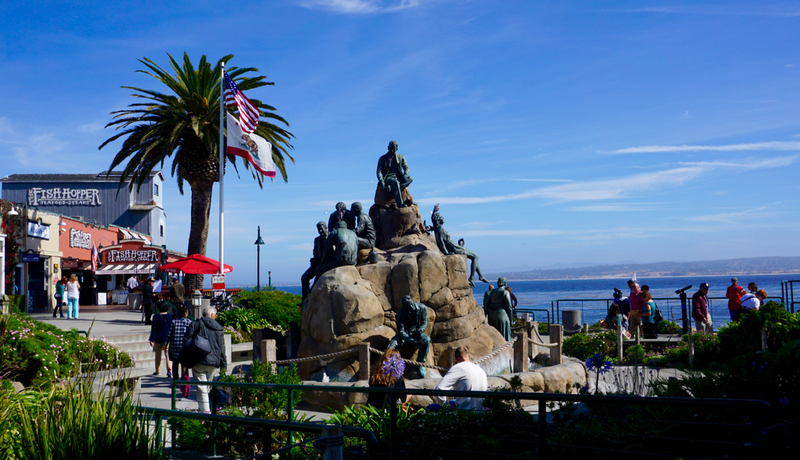 Monterey is a tourist town now, but it actually has a lot of history. 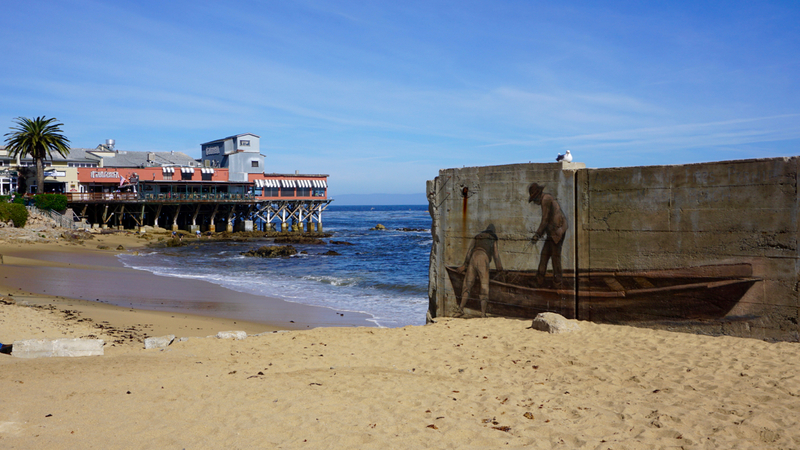 It was once the capital of California (back when the Spanish and Mexican governments ruled this area) and a major hub for the sardine fishing and canning industry until the 1950s (hence the name “Cannery Row”). 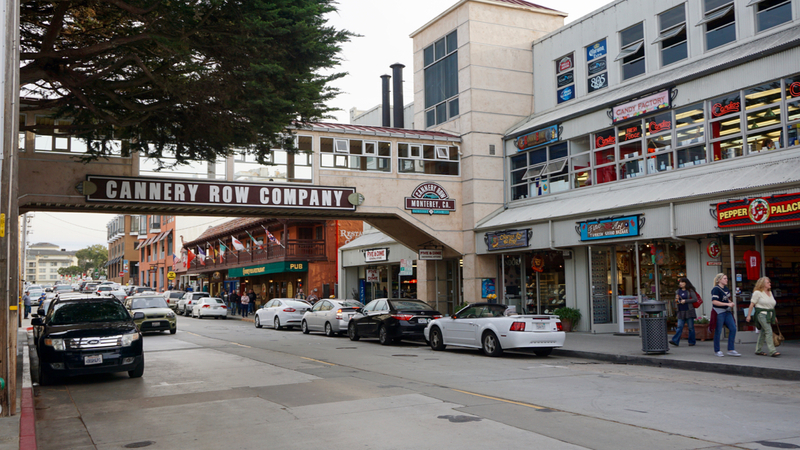 In fact, many of the buildings on Cannery Row are preserved sardine canning factories that have been converted into restaurants, shops, and breweries. And if you’re a fan of the novelist John Stienbeck this area will feel instantly familiar. He was born and raised in nearby Salinas and used Monterey as the setting for a number of his novels. Personally, I never read any Stienbeck beyond Of Mice and Men so I didn’t know what to expect before reading my guidebooks. 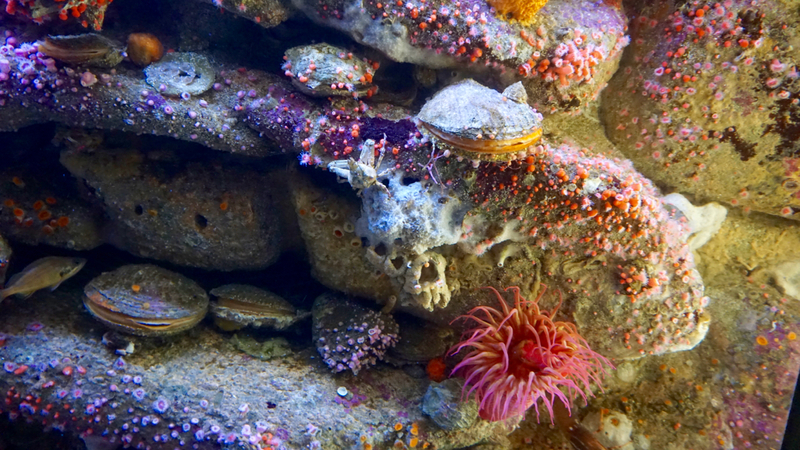 The biggest draw in Monterey is the world-famous Monterey Bay Aquarium, strategically situated right on the water at the far end of Cannery Row. 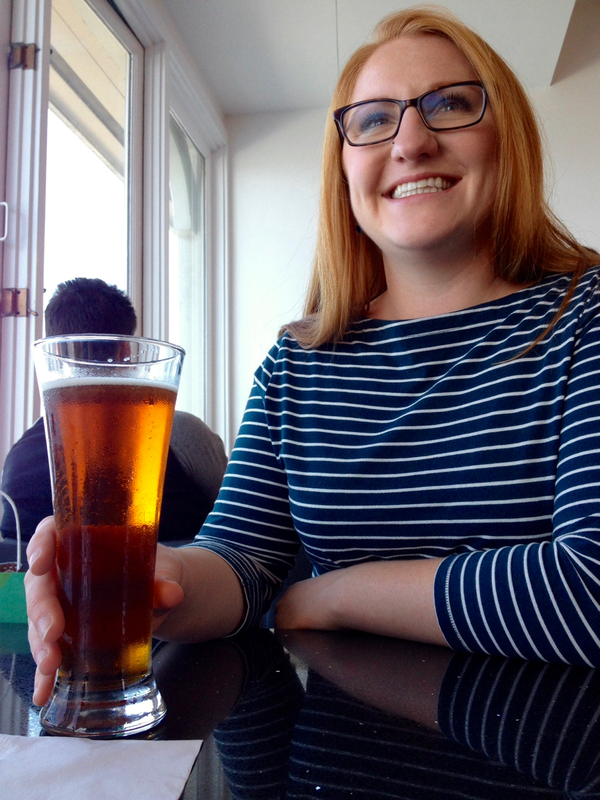 I call the Aquarium’s location on the water strategic because it allows them to do something not all aquariums can do — fill the tanks with water directly from the bay. 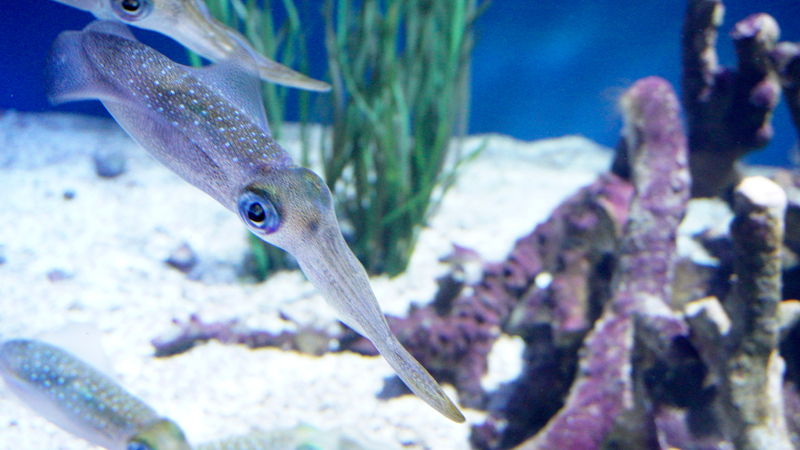 Many of the creatures living at the aquarium are native to Monterey Bay, so having water from their natural home continuously pumped in and out keeps them healthy and happy. 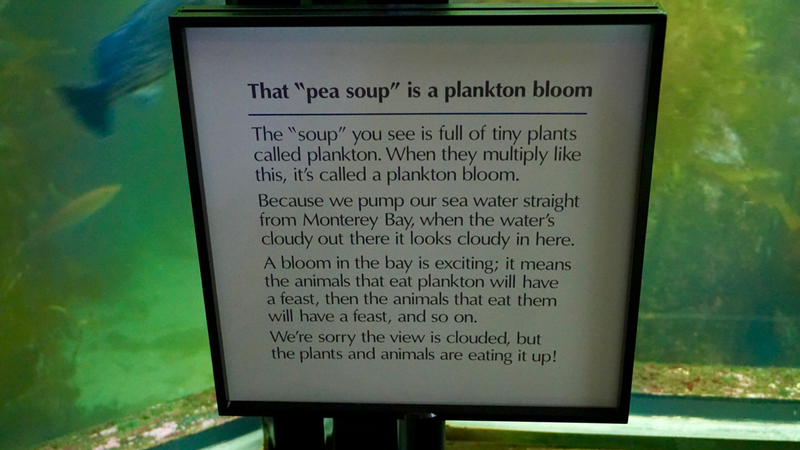 Unfortunately (for us at least), this also means that the water conditions in the Bay affect the water conditions inside the Aquarium. The cloudy water made it difficult for us to see some of the fish, but for the animals that cloudy water was a plankton feast! 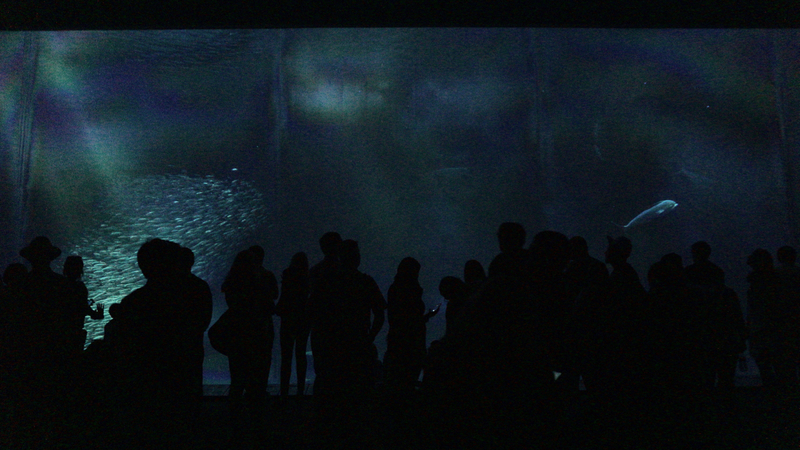 Visibility in many of the tanks was unaffected by the plankton bloom. 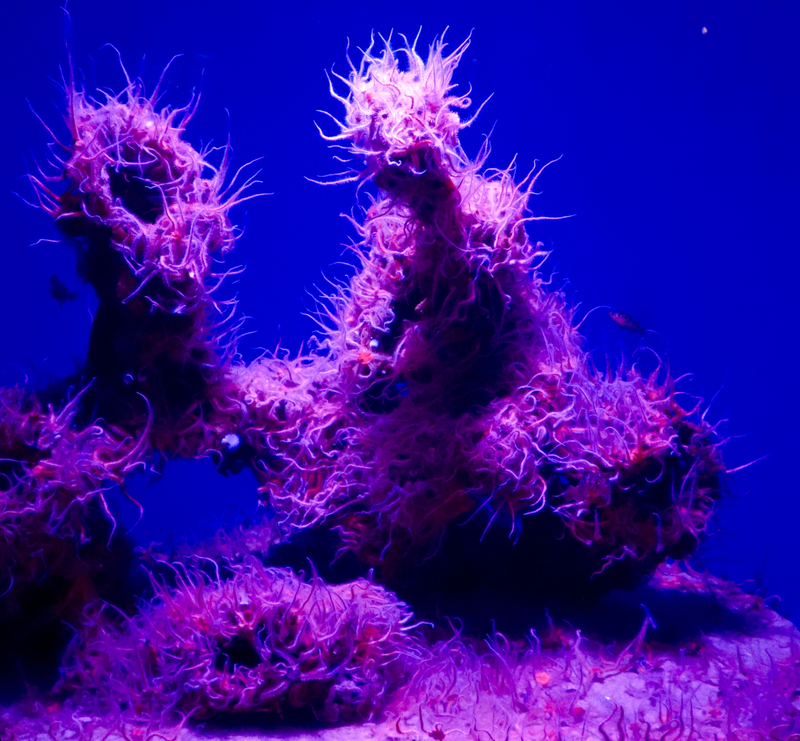 In fact, in some cases the visibility was enhanced by special tank lighting which made colors and creatures more visible than they would be in the wild. 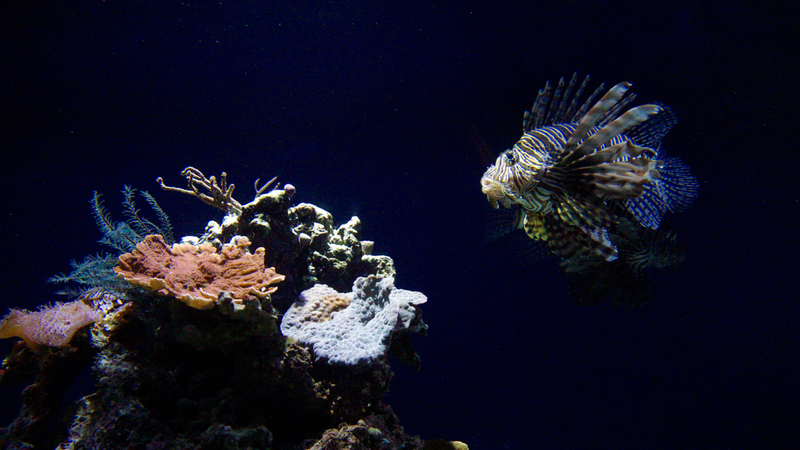 These lion fish are beautiful but considered an invasive species in some parts of the world due to their lack of natural predators. While scuba diving in the British Virgin Islands a few years ago I watched our diving guide shoot a lion fish with a spear-gun and tag it with a float for collection later. The local diving and fishing communities are working with the local government to keep the population of lion fish in check before they do too much damage to the native population of reef dwelling creatures and plants. 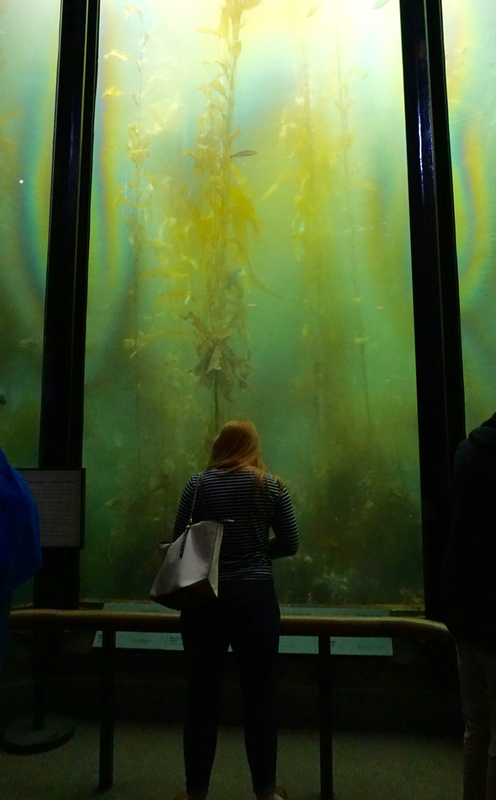 The Monterey Bay Aquarium is well-known for its large “touch tanks”. These are shallow open tanks filled with creatures that are either safe to touch or that have been “dis-armed”, thereby making them safe. The most popular tank was probably the sting ray tank. With their poisonous barbs removed these creatures are essentially harmless, but are lots of fun to watch and feel like slick leather if one gets close enough to touch. 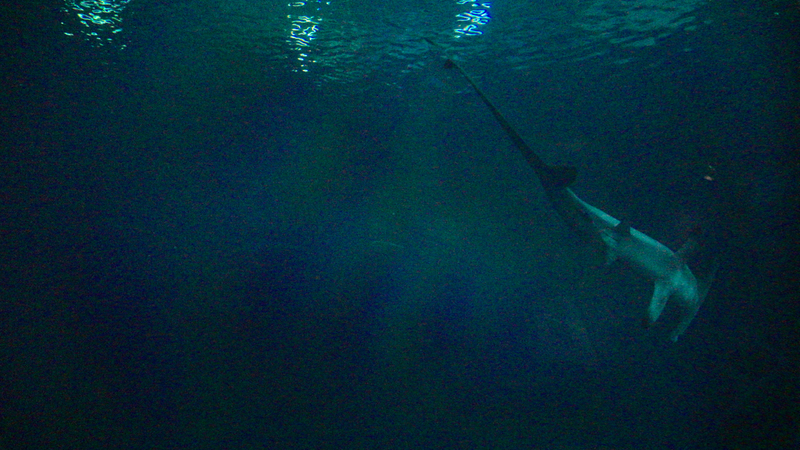 The sting ray tank was pretty crowded with little kids so I mostly stood back and let them have the fun. Not a sting ray. 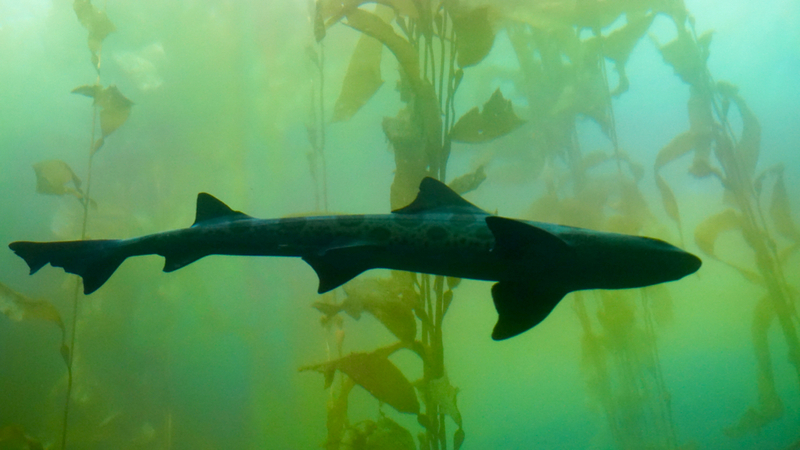 This is some type of small harmless shark (I think). The touch tank area was also the seabird aviary. 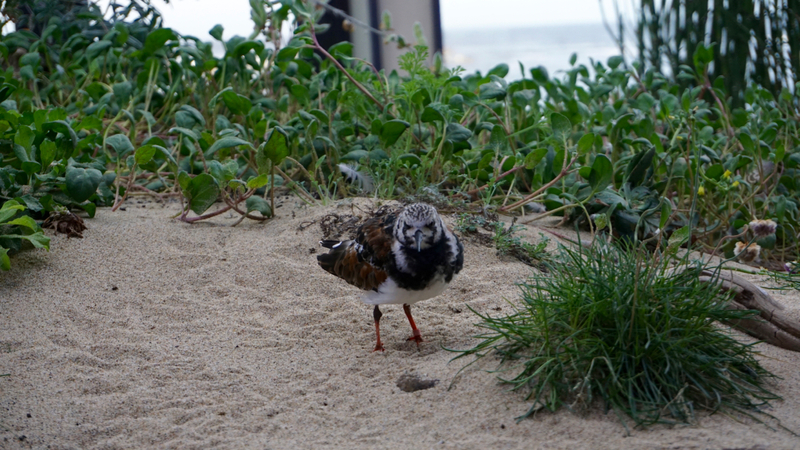 This little guy did not seem pleased to see so many people or maybe we just woke him up from his nap. 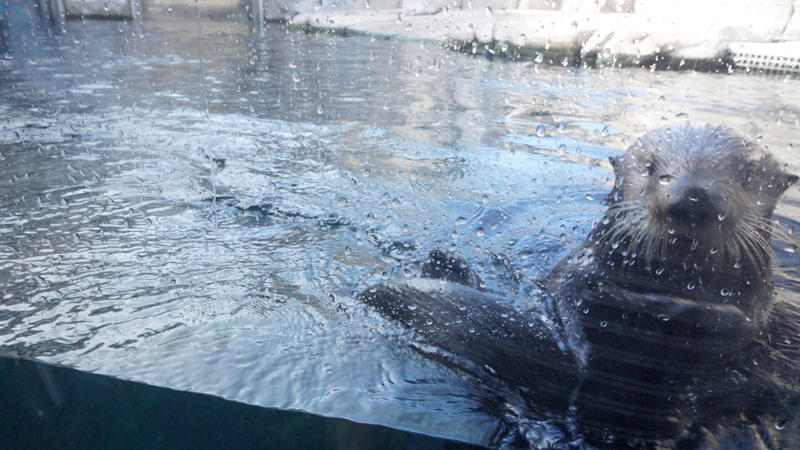 We had about an hour to kill before the scheduled otter feeding, so we stopped by the almost as adorable penguin feeding. 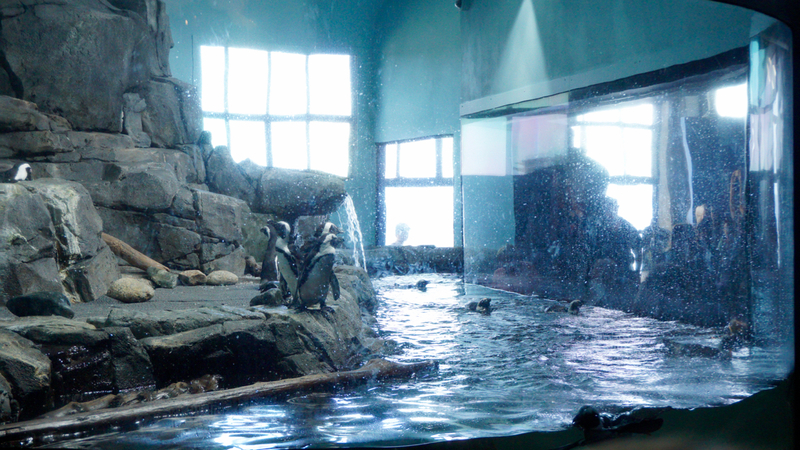 This particular aquarium keeps African Penguins instead of arctic penguins because the African Penguins are more comfortable in the natural climate of Monterey and therefore much easier to keep healthy in captivity. Keeping arctic penguins (i.e., Emperor Penguins like in the movie Happy Feet) healthy and happy in captivity requires building a gigantic freezer and snow machine for them. This uses a lot of extra resources. 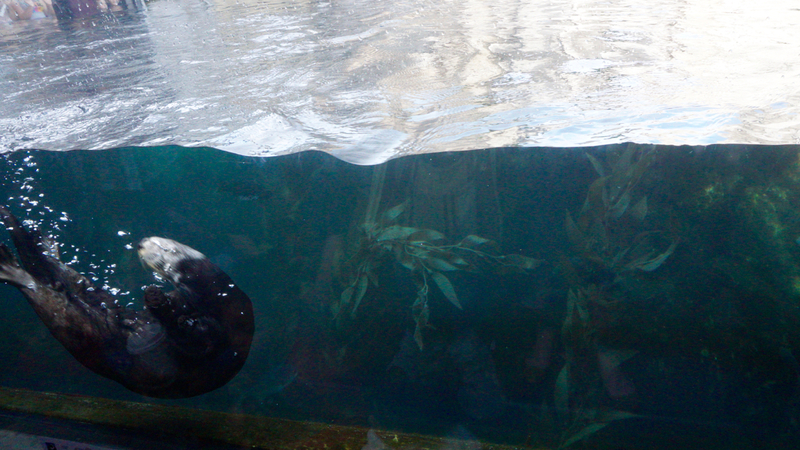 I was super excited when I found out the aquarium had an otter tank. Otters are basically the puppies of the sea. They frolic and play and even hold hands when they sleep so that they don’t drift away from each other. All together now . . . Awwww. Otterly adorable. 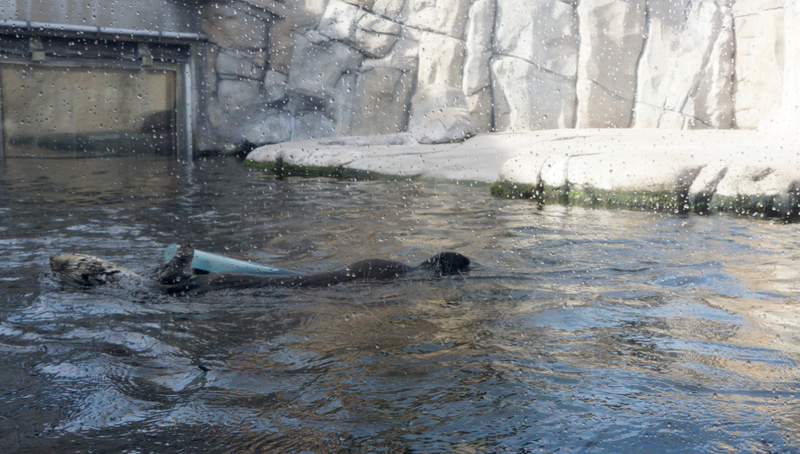 Unfortunately, the otter tank was so covered in splashes from the frolicking otters that it was almost impossible to get a good photo of them playing. But I think this little dude thought I might just have some spare fish stashed in my purse. 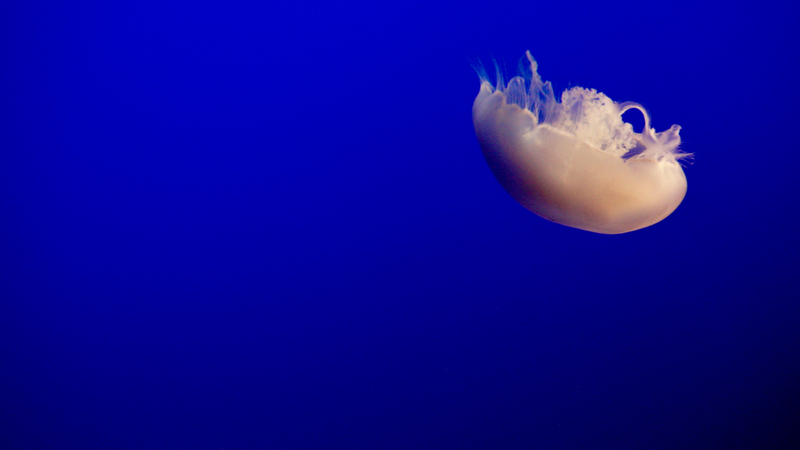 Once we finally moved on from the otter tank we found something not nearly as cute but rather beautiful and fascinating – The Jelly Fish Exhibit. The backlighting in the tanks was a great touch (I’m assuming the light doesn’t harm them but I honestly don’t know). 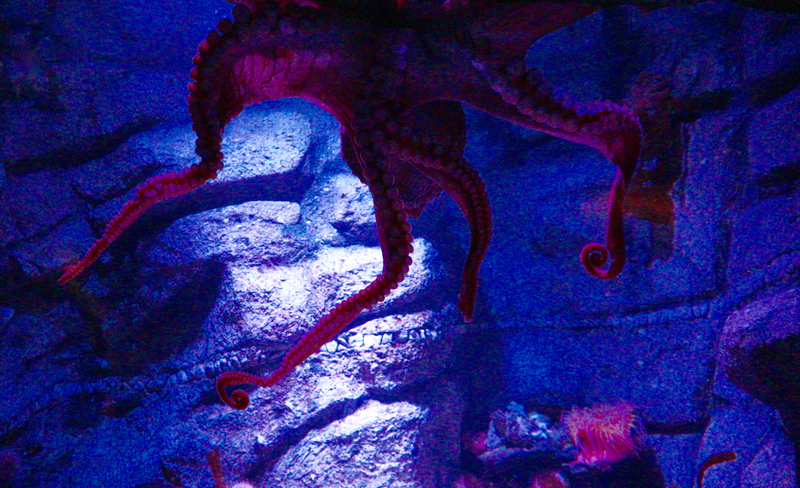 In some tanks there was even a button you could press to briefly turn off the lights, showing you how invisible these creatures might be in the open ocean. It was a little unnerving but way cool. 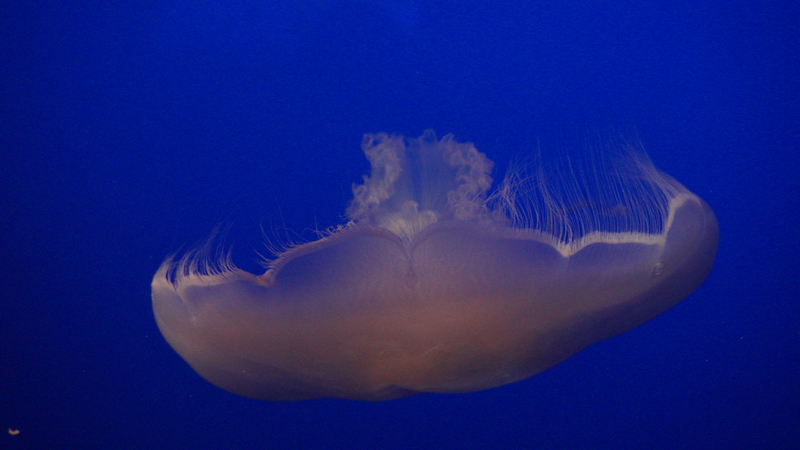 My favorite were the Sea Nettle jellies. Their striking orange color against the well-lit blue of the water was hypnotic. Us, and about 15 other people, spent a good amount of time just watching this one tank. 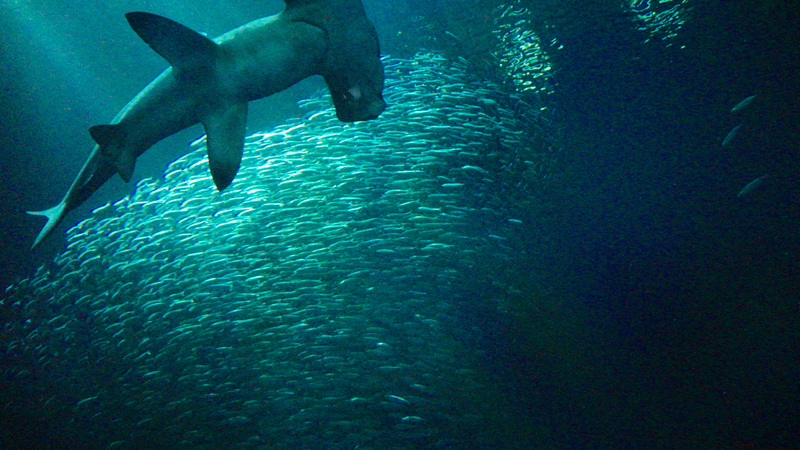 The nearby Open Ocean Exhibit included a sardine tank which seemed to have a constant circular current (or maybe the fish were creating their own current). 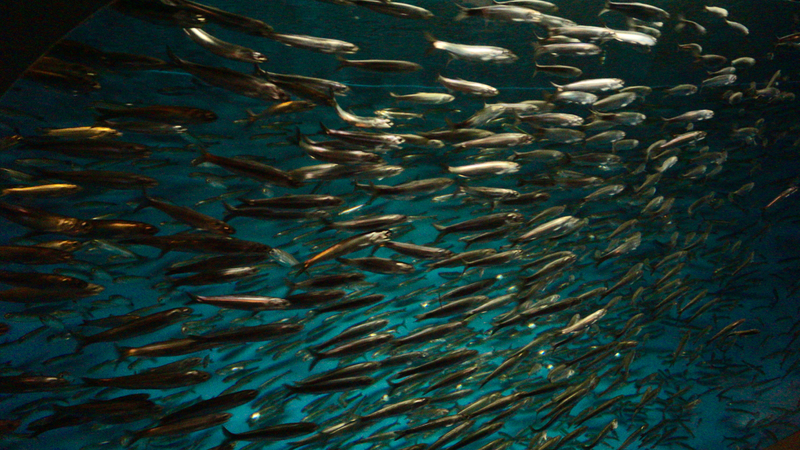 The school of sardines appeared to be swimming in a perpetual circle, filter feeding from the plankton rich water pumped in from Monterey Bay. This was the largest tank at the aquarium but we couldn’t see very far due to the plankton bloom and dark lighting (probably necessary because, unlike jelly fish, these creatures all had eyes). 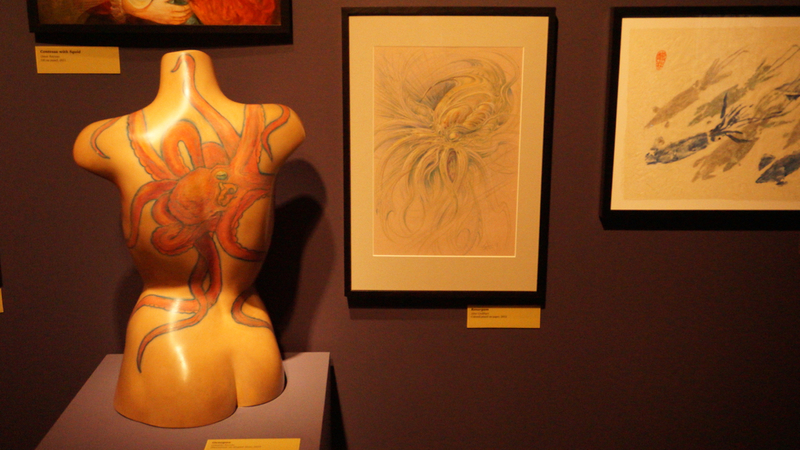 The Tentacles Exhibit featured octopuses, squid, cuttlefish, and nautiluses, as well as various tentacle inspired art and history. We left the aquarium right before close at 5pm, hungry and thirsty, but were unsure where we should eat dinner on a street literally packed with restaurants. We ended up walking up and down the street reading the menus posted on the exterior walls until we settled on something. Cannery Row Brewing Co. had the coolest looking building and a menu that sounded tasty but we were in the mood for something other than pub food. 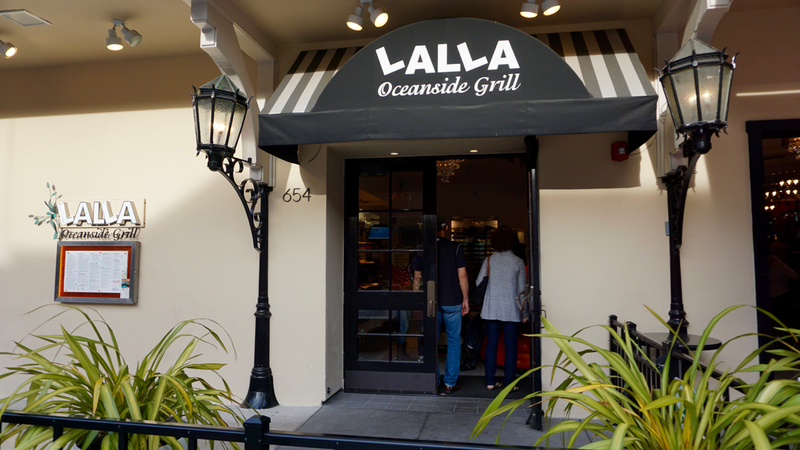 We decided on Lalla Oceanside Grill because they served tropical umbrella drinks (which Brandon loves) and Anchor Steam Beer (which I love). I appreciated that all of the restaurants posted their menu on the exterior wall next to the door. It was easy to browse without feeling intrusive. I’ve noticed restaurants mostly do this in tourist areas, presumably because most visitors don’t know their way around, but I enjoy wandering a new street to read the menus. Sit by the window if you can, the view is awesome. 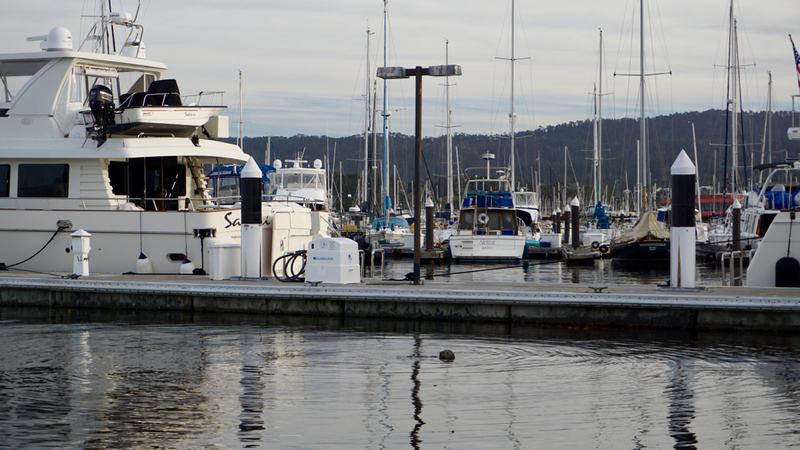 On the way home I spotted a real-life sea otter in his natural habitat! 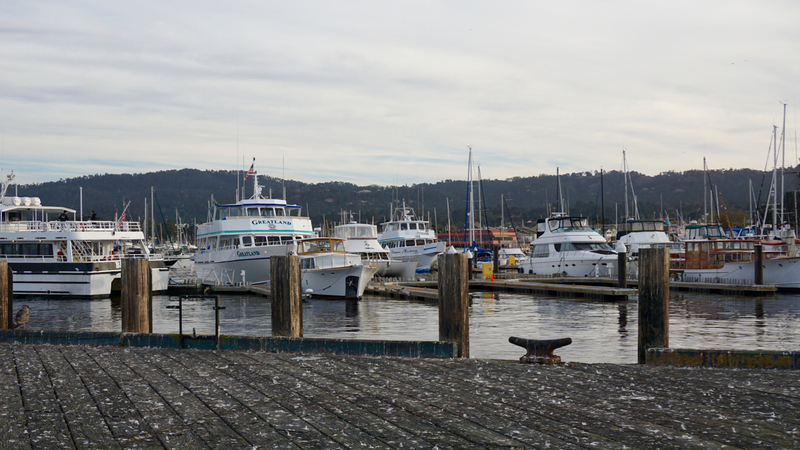 We had pulled into one of the marina parking lots to take a walk on the docks and look at the boats. 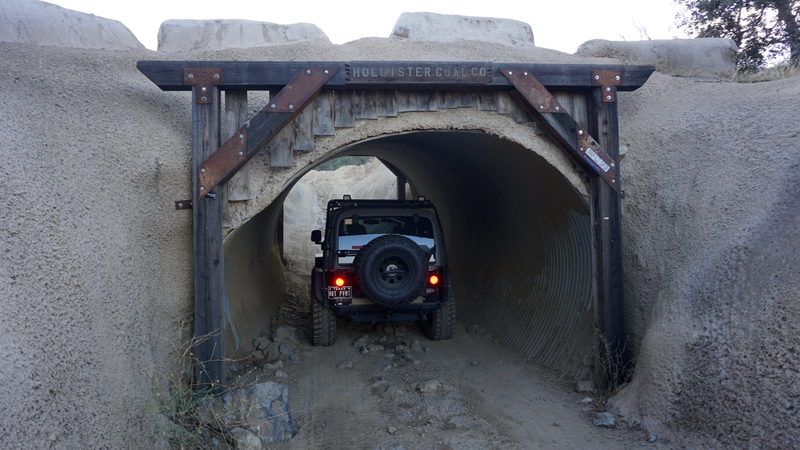 And, of course, so we could take photos of the Jeep in cool places. This Jeep is by far the most traveled and photographed vehicle either of us has ever owned. And then I started seeing the sea lions! 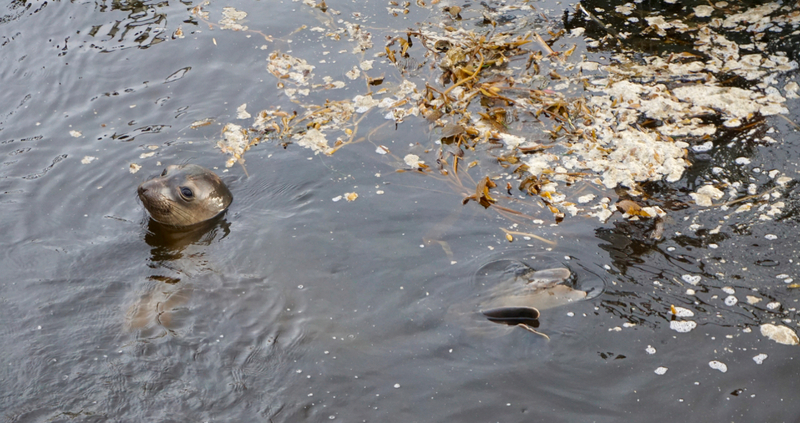 If you love sea mammals like I do you will seriously lose it in Monterey. These guys are so cute and they are everywhere! 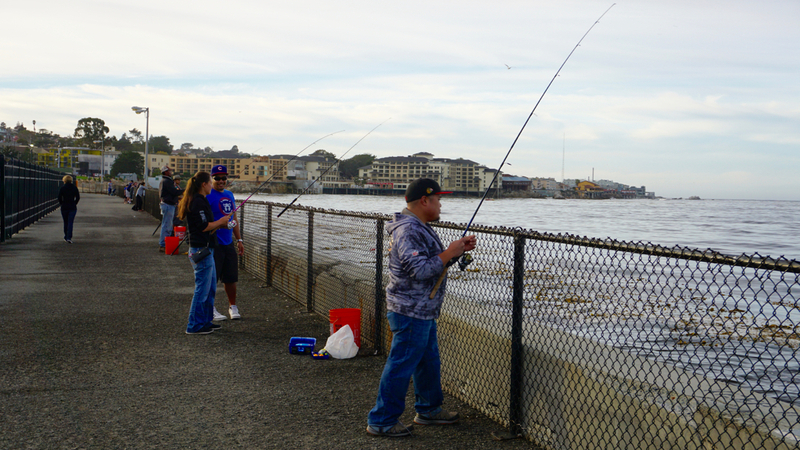 Because Monterey Bay is a marine sanctuary, the water is full with wildlife. 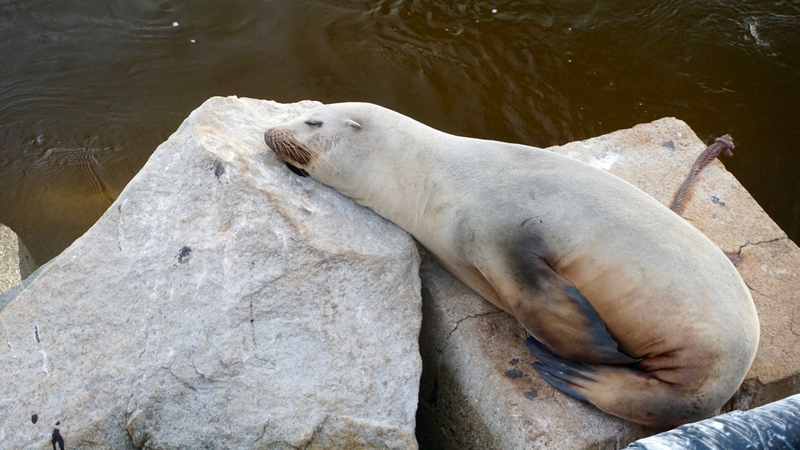 During low tide, the sea lions congregate on the rocks on each side of the pier. These two were occupying the few remaining rocks. 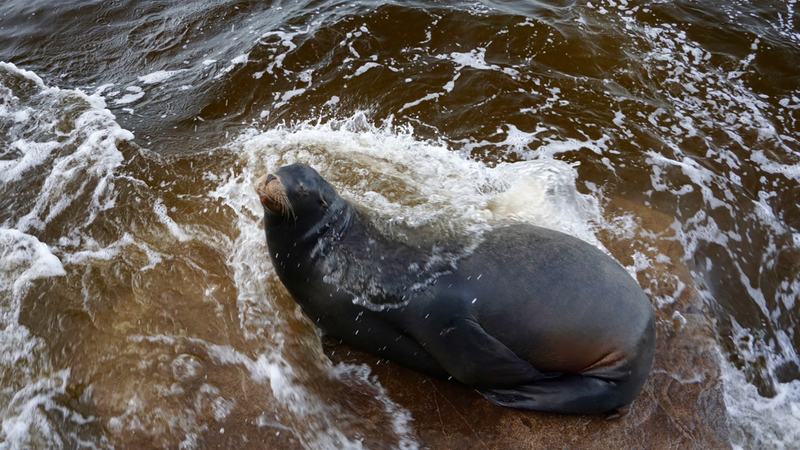 Enjoying his high-tide sea lion bath! 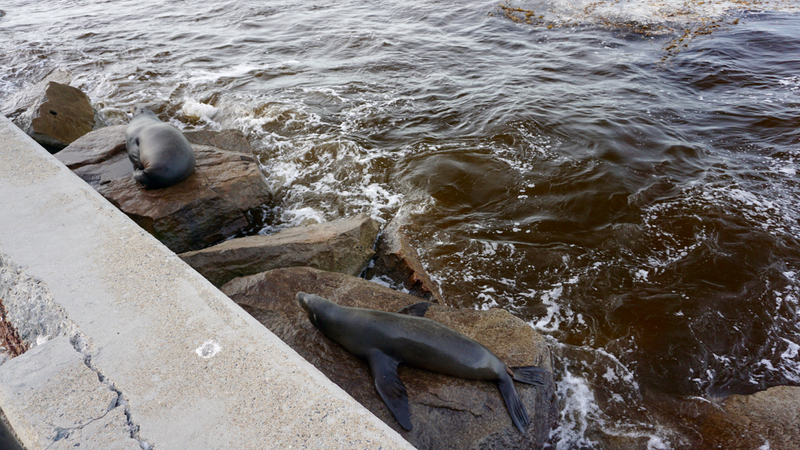 During high tide, the bulk of the sea lions congregate up on the pier. It’s a pretty amazing sight. 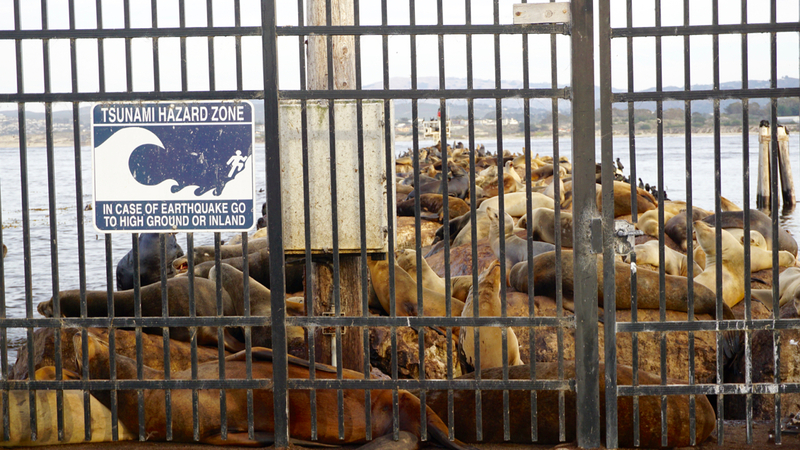 Just piles and piles of chubby, barking sea lions. The gate stays locked so people can’t interfere with them. That is very much their pier, not ours. However, the local woman standing next to me told me wildlife workers do enter if a sea-lion is endangered (perhaps tangled with a rope) and they can help the animal without causing a disturbance amongst the group. In the video below you can hear what they sound like. With this many in one place it can get pretty loud. 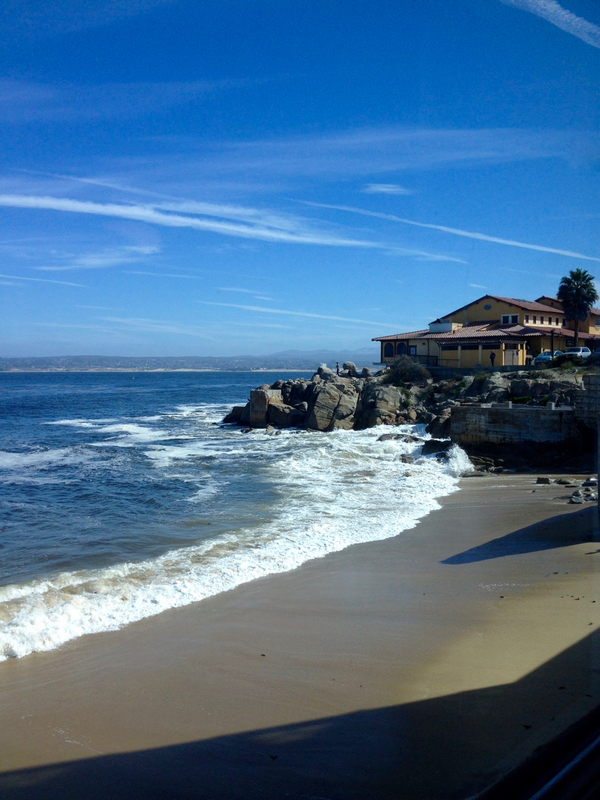 Honestly, we could have spent an entire second day in Monterey. We didn’t even get into the historic tour of the city, which I hear is very interesting. But such is travel, you can’t do everything in one trip. While on the way home from Monterey one day I started to notice something. There sure seemed to be a very healthy population of off-road toys. Not just quads, dirt bikes and glorified golf carts, we see these everywhere. What caught my attention was the number of well-built Jeeps and trucks. I’m not talking about the frat boy Bro-Dozers you see pounding the pavement in the cities of America, quite the opposite. 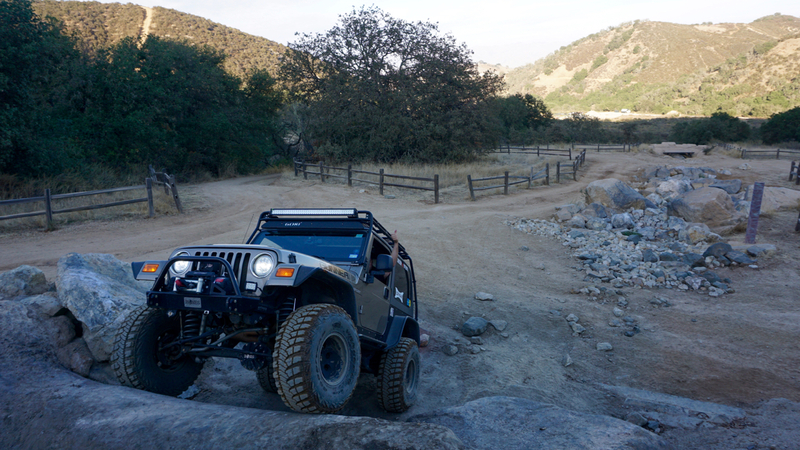 Purpose-built rigs that are designed and modified to take on the toughest of terrain. 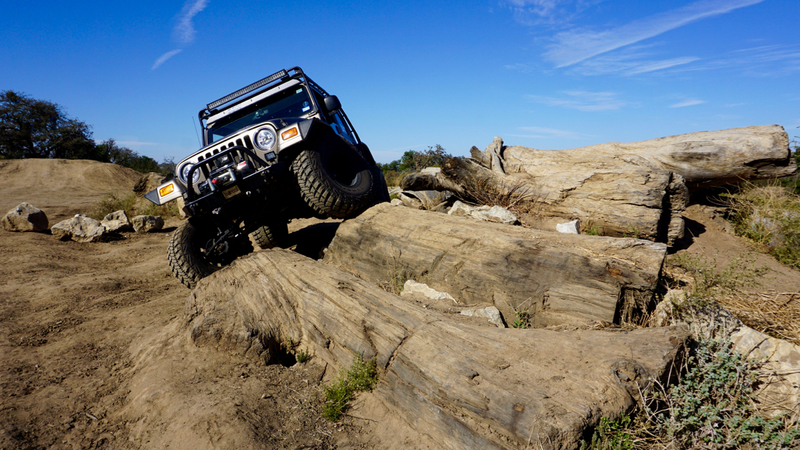 Rock crawlers everywhere! 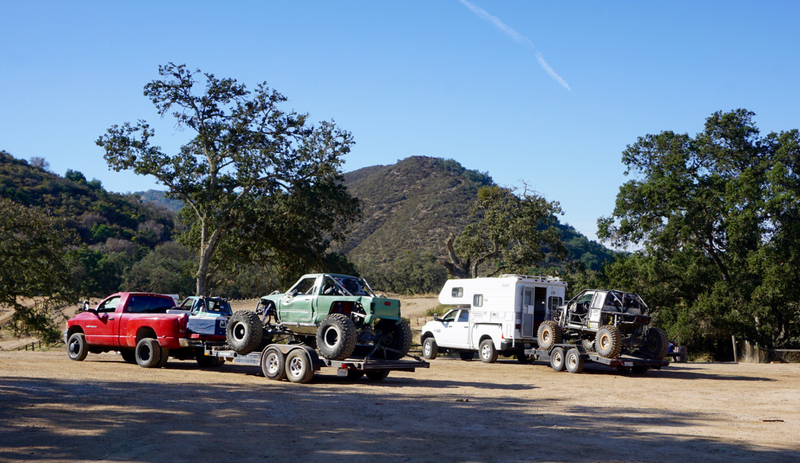 Barely street legal rigs up to trailer-queens being towed to some magic place I had yet to discover. While driving, I did as I usually do and exclaim I know where I am and then promptly take the wrong street. By the time my stunning and cunning red-headed copilot caught on to my awesome navigation skills it was easier to continue our course than it was to back track. That’s when I saw a sign…not a message from the Universe, a real sign. Hollister Hills S.V.R.A., with an arrow pointing in the direction I was driving! 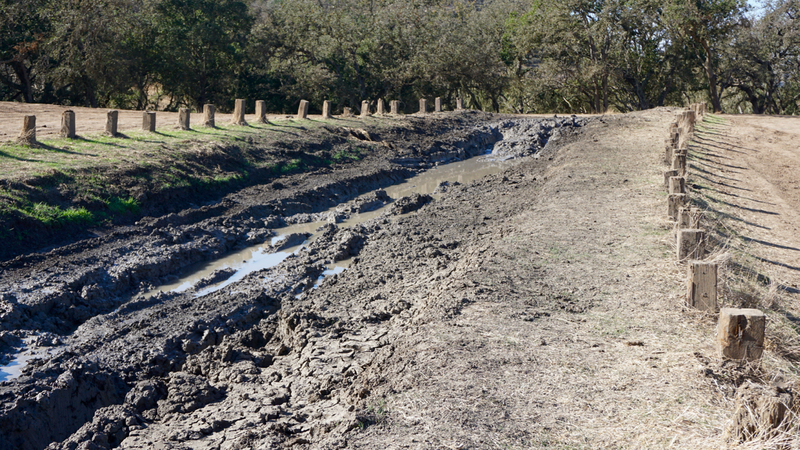 This was one of California’s State Vehicular Recreation Areas. As anyone in a Jeep would, I began to smile. This explains all the off-road mechanical muscle that’s roaming around. So I sharpened my retinal radar and looked for an entrance. By this time it had gotten dark on us. I couldn’t see anything anyway. But we found some signage that gave an overview of the area and what type of vehicle was allowed on what trail system. Currently we were standing in a empty parking lot of an area intended for hiking and horseback riding, but we could see the area set aside for four-wheeled fun, 800 acres only 5 miles from camp! Bingo! I had a plan now. The rest of my evening was used finding wifi so I could do more research into the trails and get a map. The next morning I loaded up Gunner with all the essentials. Tools, straps, water, extra clothes, cameras, GPS, air compressor, and a pretty girl. That same pretty girl made a badass lunch to take to the trails too! We had no idea what to expect, even with the power of the Internet and detailed maps there is still no way to know what will come up. To the woods! From the main road we took a short trail through the woods that lead us to a staging area next to an “obstacle course”. 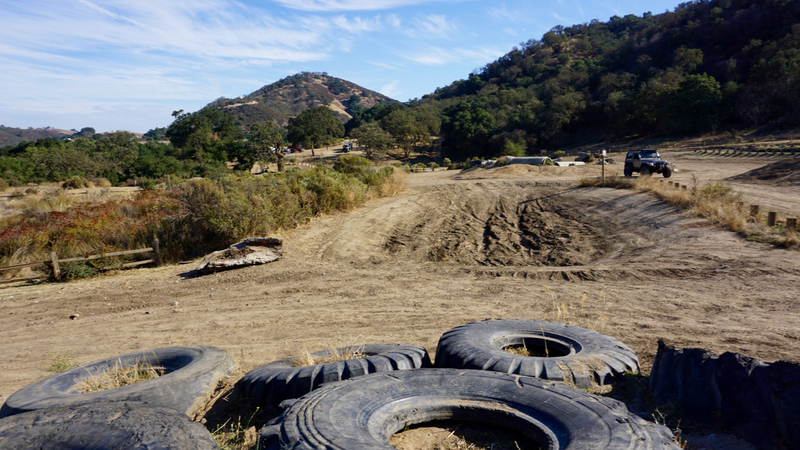 That peaked my attention because I’d never been to a real off-road obstacle course before. Most of the trails we hit are in the woods, on the beach, or “roads” in the desert. I’ve seen pics and videos of courses that are built with concrete blocks, logs, pipes, cars, or anything else that can take a beating. Damn right I wanted to try that! We wanted to eat before before we drove through the course, but I had a nice look around before we sat down. I could instantly tell this course was made for rigs well above my level. For instance, I’m running 35″ tires on Gunner. I would need 42″ or taller to run this stuff. 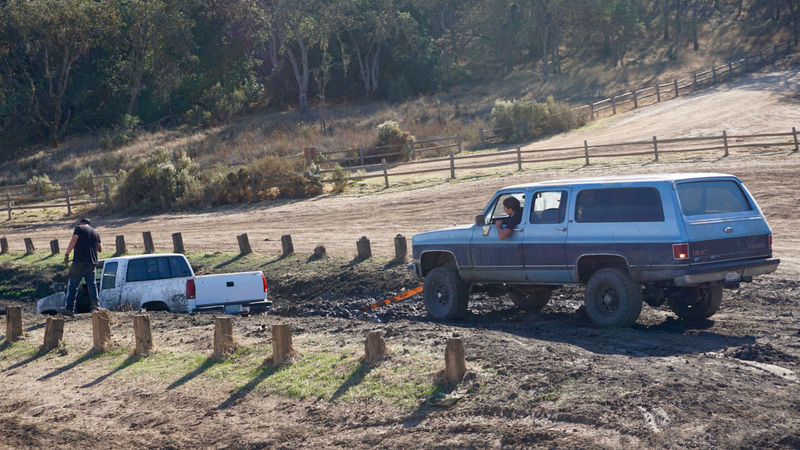 Without going into much detail, it takes a substantial amount of cash to equip your rig to even run tires that big. Pretty much everything is getting ripped out and upgraded to the point that the vehicle body is all that’s left of the original car. But by damn, I was going to have some fun with what I could! 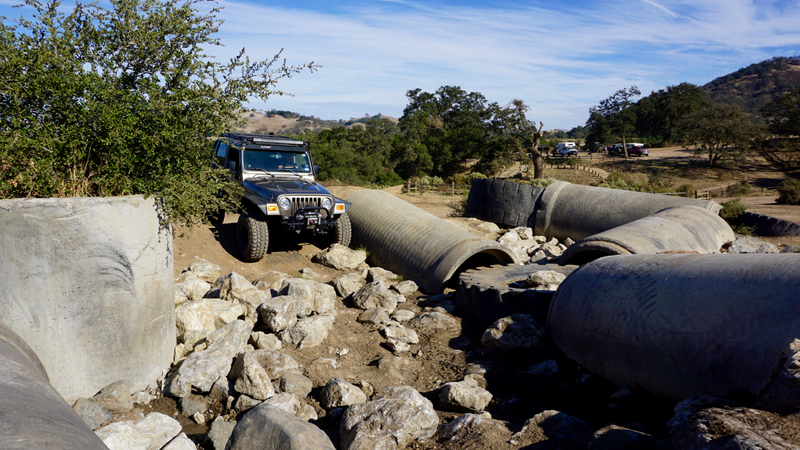 I had a blast crawling around and getting the most articulation out of the jeep that I could. But like I said, we were not equipped to take the main lines through the obstacles, more like playing in the shallow end of the pool. 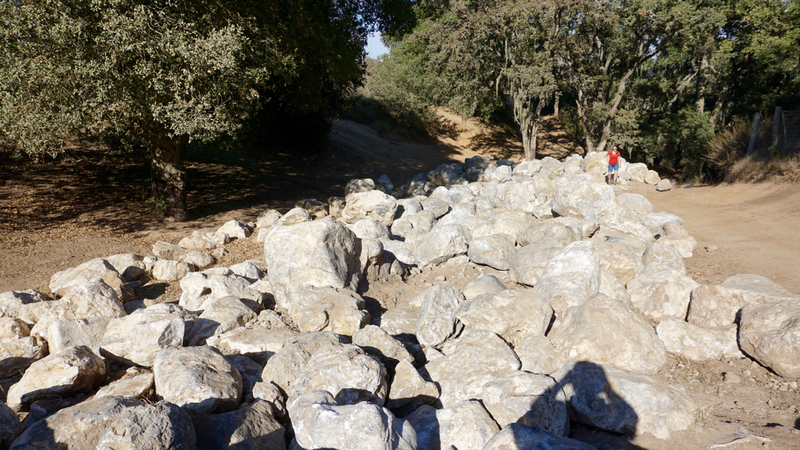 Testing out the man-made materials and have to say it’s a very different feeling compared to the forest service trails and rock gardens I’ve driven through before. It was lots of fun and I drove around with a Kool-Aid smile! I knew I’d have to leave this area pretty quick though, I’d get cocky and bust a move (or a part) and we had more trails to we wanted to check out. We went down several trails that connected to the McCray Road Trail. This trail spanned most of the park so we used it as an anchor in navigating. The map had another obstacle course further down so we pushed on to see what it had to offer. Something seemed familiar about this place, like I’d seen it before. It was very obvious when we got there. 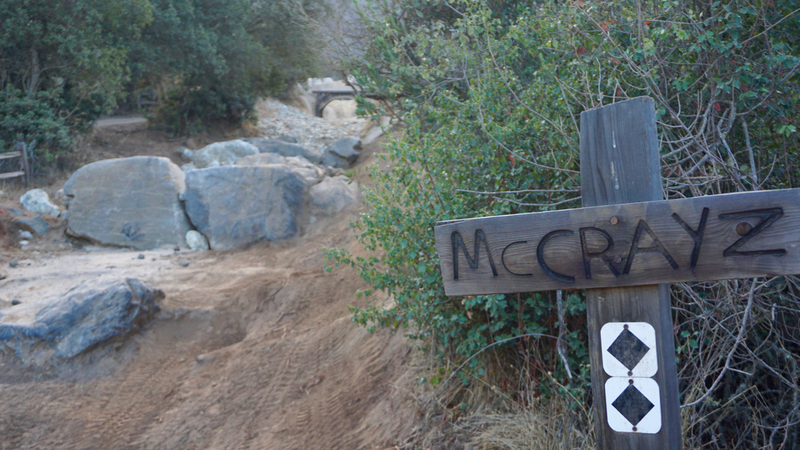 We had found the double black-diamond trail dubbed McCrayZ! It’s easy to see why. 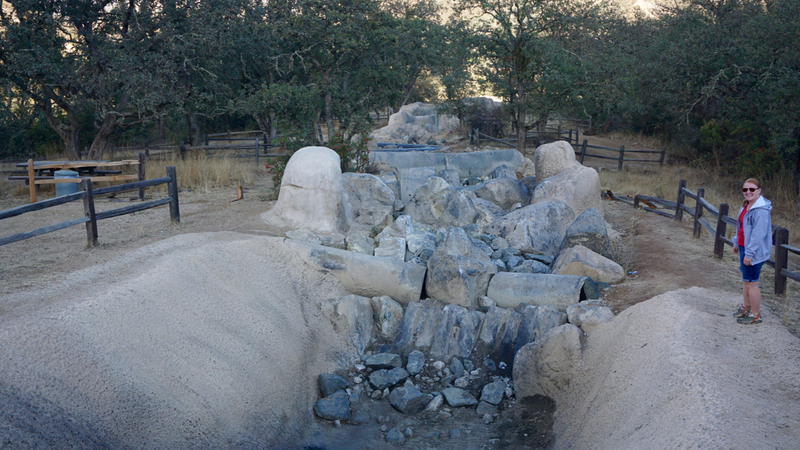 The obstacles here were huge, cast outta concrete in the most insane shapes. So unnatural that it would be a new type of wheeling to anyone but the locals. 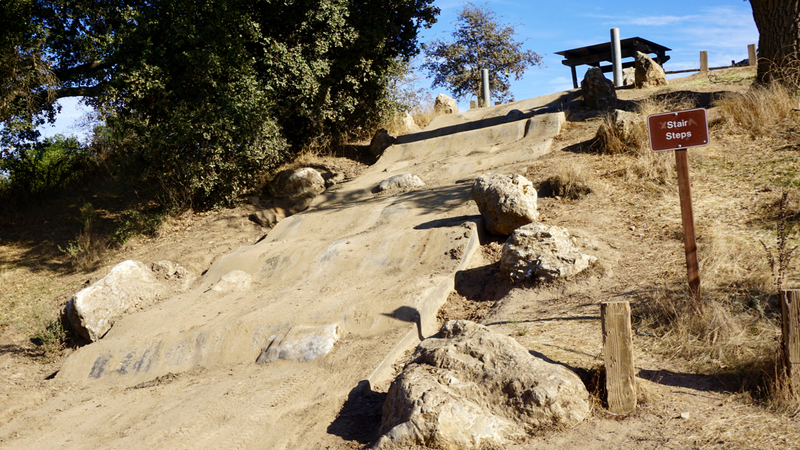 The coolest part was our very easy trail snaked and zig-zagged thought this bad boy. 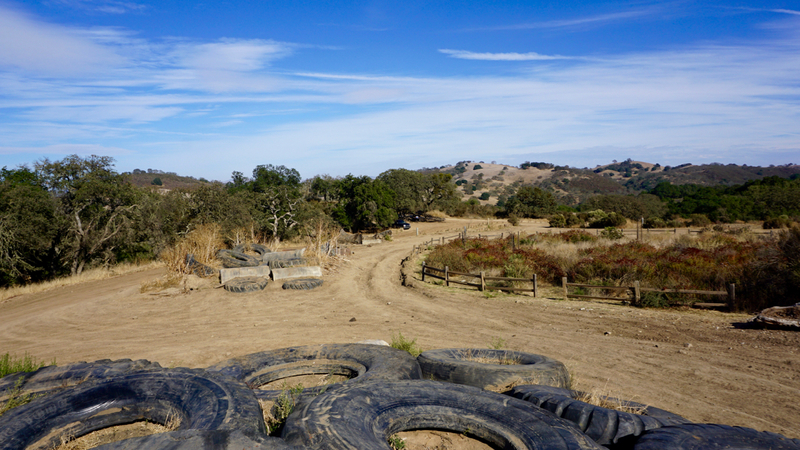 So no harm done to Gunner, and we got to check it out all the obstacles. It dawned on me that I’d dreamed of going here for some time. I’d watched several competitions held here on YouTube. This was home to Top Truck Challenge for the last few years. The video below will give you a better idea as to why I keep mentioning that I’m ill prepared for this type of trail. So….that’s my story. 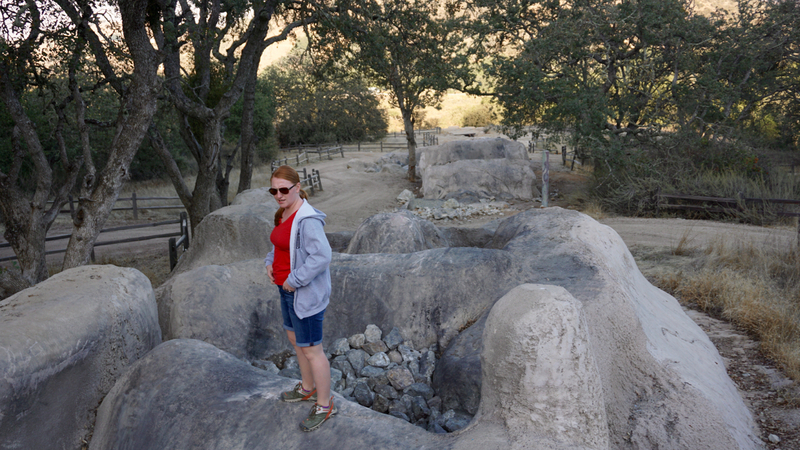 This started out as just a small blurb about Hollister Hills, but you can probably tell I enjoyed this place immensely. If I find myself in the area again, I won’t park Alpha 1 at the same campground, but I’ll definitely come back here! Thanks for making it to the end of my little blurb, report back to Jenny. 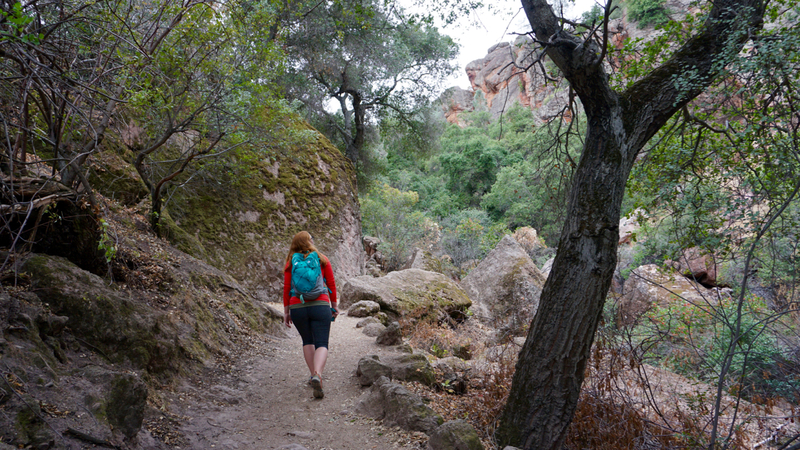 Pinnacles is one of the newest National Parks but it has actually been around a long time. The area was preserved as a National Monument way back in 1908, but was not given National Park status until 2013. In fact, most of the souvenirs in the visitors center still called the park a National Monument. 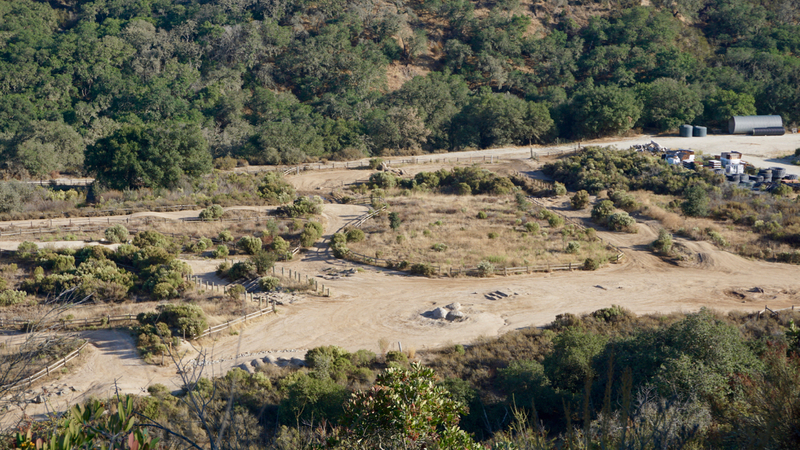 This entire area is made up of chaparral, a type of vegetation that consists of grasses and a variety of evergreen drought resistant shrubs (Thank you, park brochure, I had been stuggling to find a name for this.). 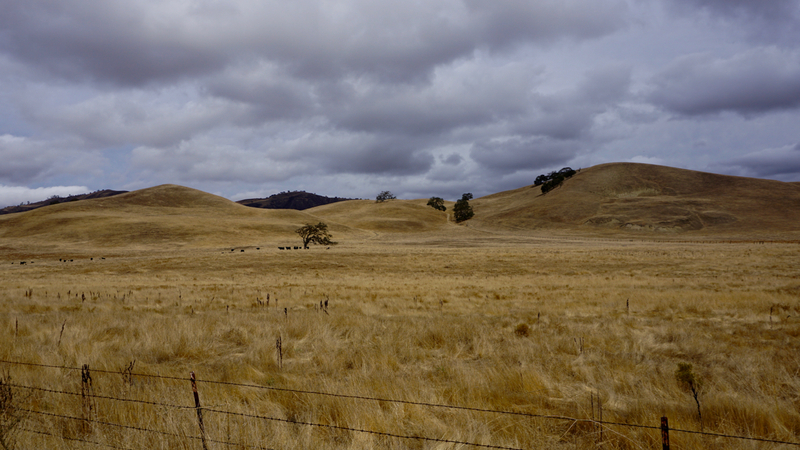 I don’t know about other times of year, but in the early fall it was mostly yellow rolling hills spotted with black cattle. 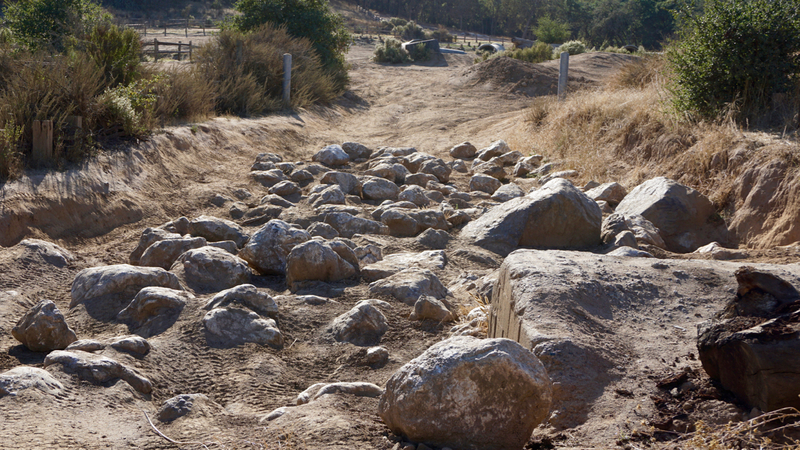 However, this area lies along the San Andreas fault line and was once a hotbed of volcanic activity. 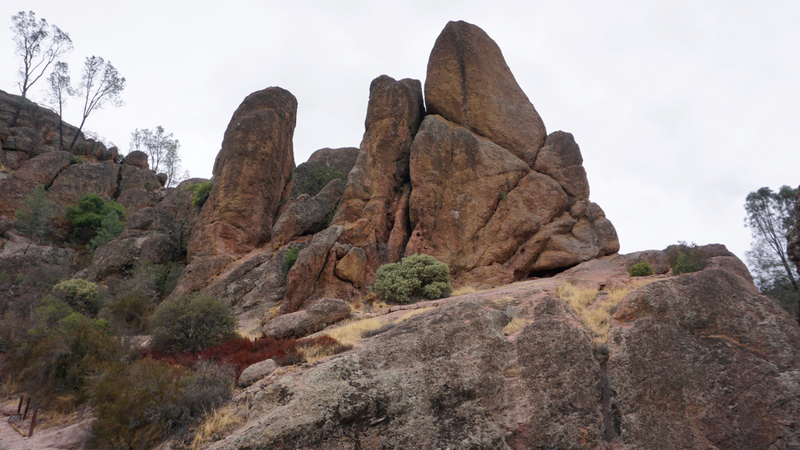 The remnants of that activity can be found in the rocky spires and jagged cliffs of Pinnacles National Parks. The dramatic difference within the park compared to the surrounding farmland makes this an interesting place for a day hike. 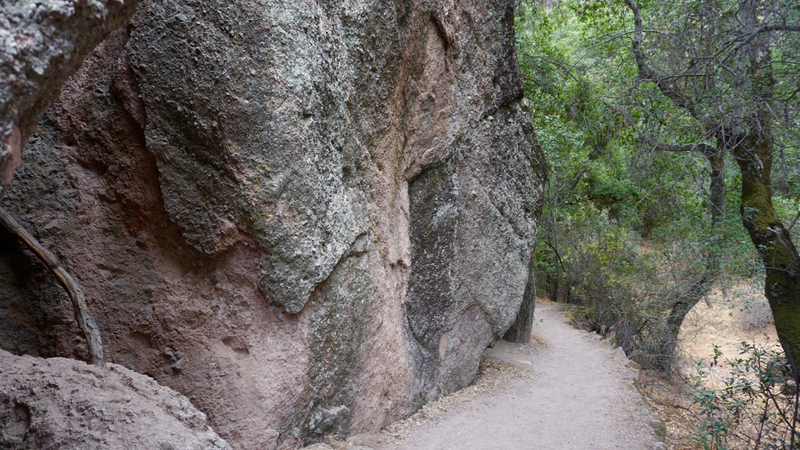 The area is also popular with rock climbers, who can practice their skills on some of the many established climbing routes. 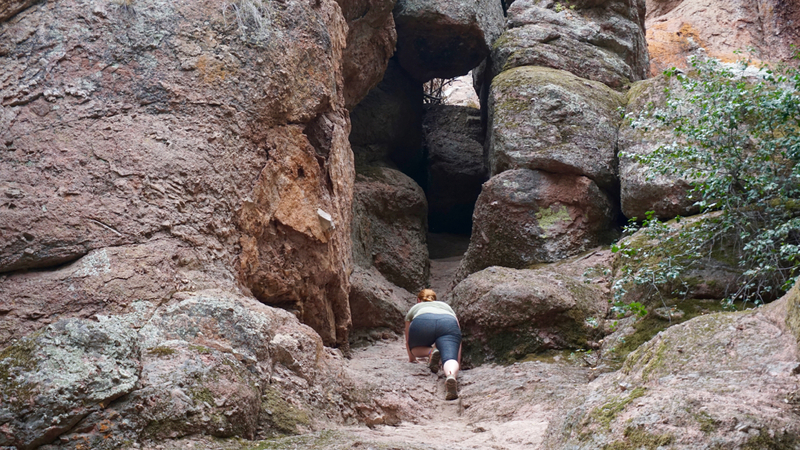 We didn’t have a plan in mind when we arrived so we asked the park ranger at the visitor center for a day hike recommendation that would be the most bang for our buck. She suggested we take the Moses Spring Trail to the Bear Gulch Trail and return via the Rim Trail. These were all pretty short trails, in total it was less than three miles. It was also a fantastic recomendation and I highly recommend it. In less than three miles we hiked along a ravine, through a cave, past a reservoir, and up to a fantastic viewpoint of the valley below. 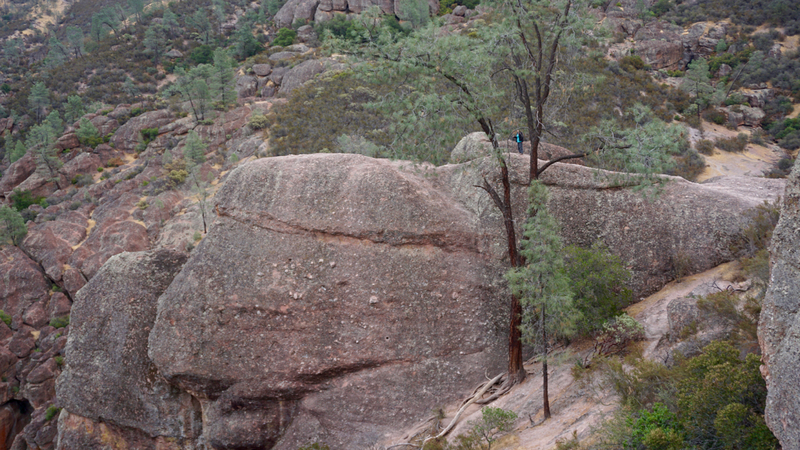 It was immediately evident why this area is popular with rock climbers. 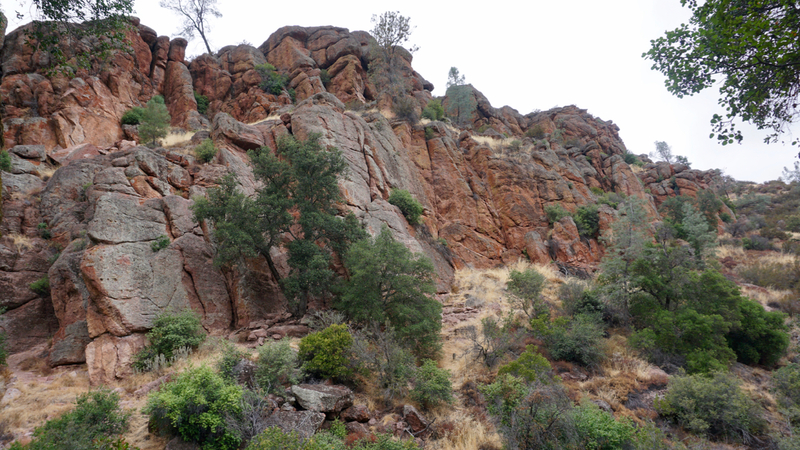 There are tons of craggy rock cliffs to scale. 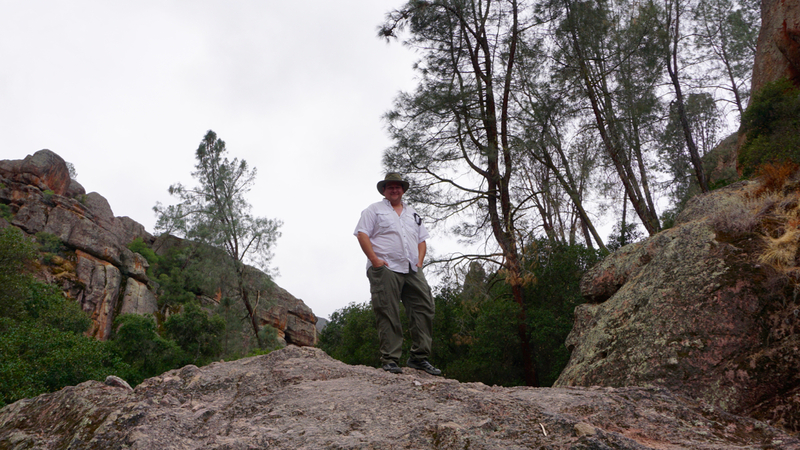 There are also lots of less steep rocks, just asking to be explored. 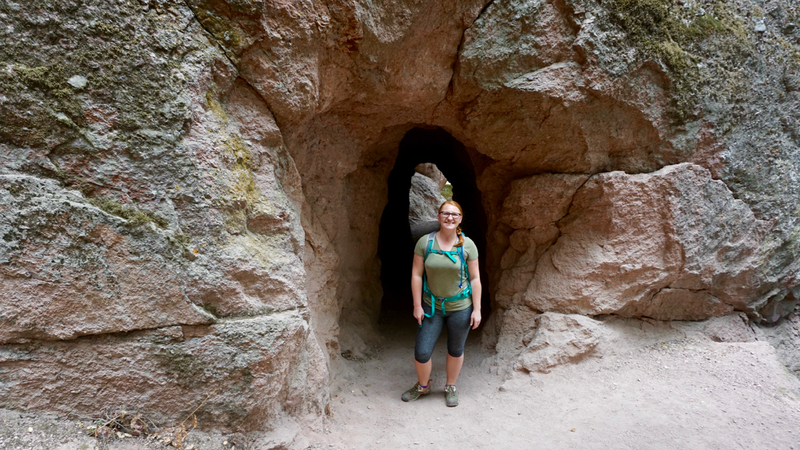 The Bear Gulch Cave section was unexpected and awesome. 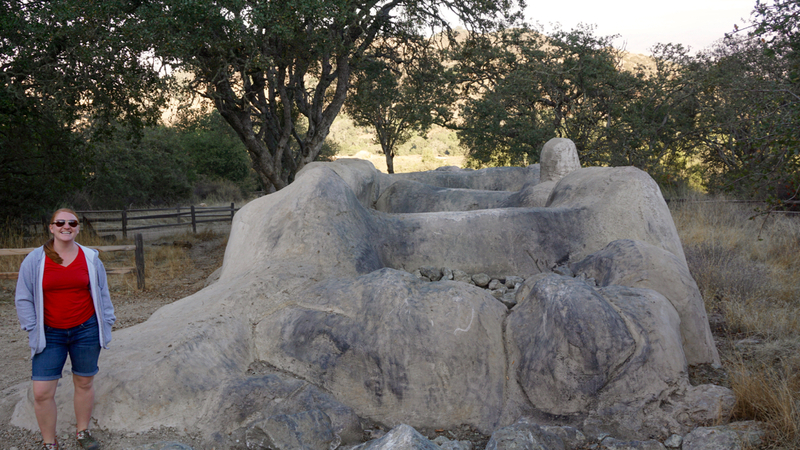 The park is home to a number of above ground caves. These wet, dark tunnels were formed by huge chunks of rock falling and becoming wedged between the spires, leaving a space for water to run below. Within the caves live a number of different species of bats, though we didn’t see any in the daytime. 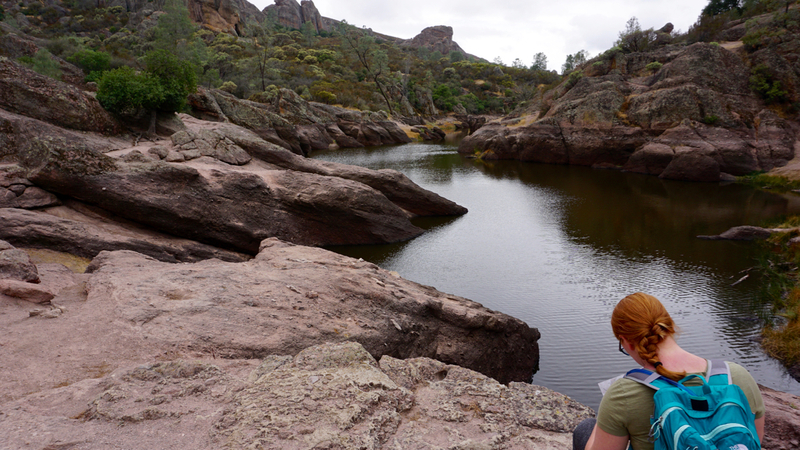 The caves open up to Bear Gulch Reservoir, a perfect place to stop for a break. 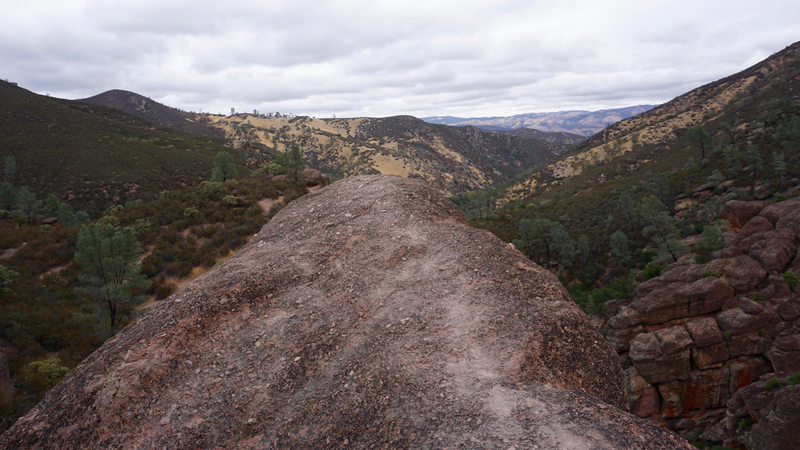 From here you can continue on a longer trail to North Chalone Peak or take the Rim Trail back to the picnic area. 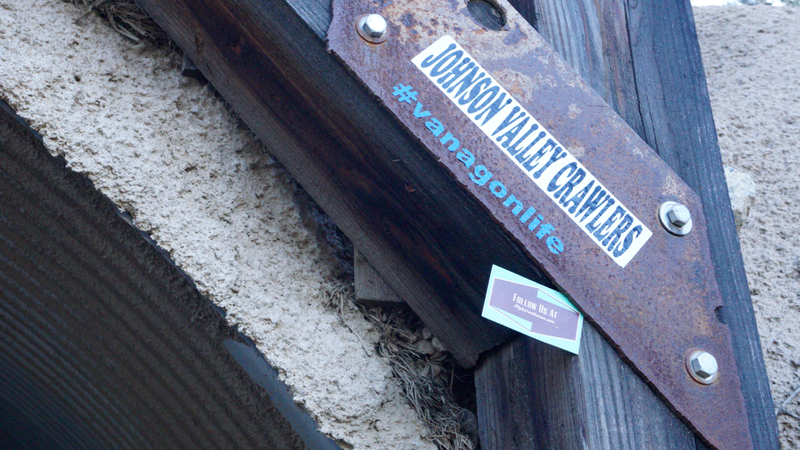 The Rim Trail is exactly what it sounds like, a walk along the rim of the canyon. The views are perfect. 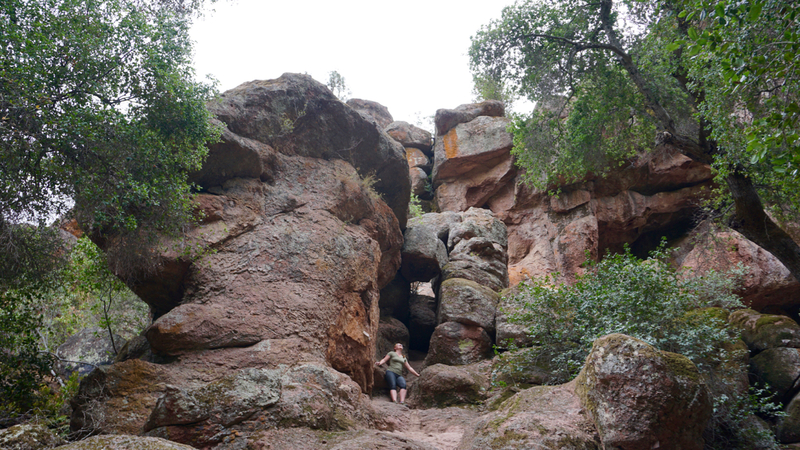 Brandon was brave enough to walk out along this natural viewing platform. I freaked myself out by looking down and only went about half-way and turned back. He said the view was totally worth it. Look closely and you’ll see a person between the trees. I walked out a bit farther than she did. Brandon walked all the way to the edge. 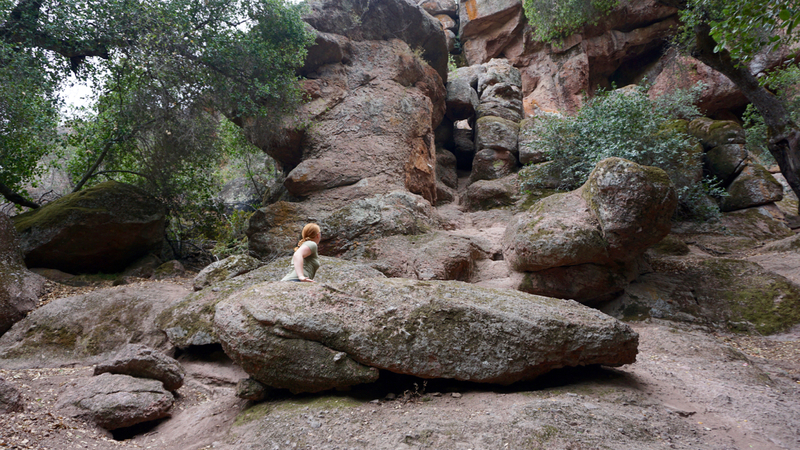 I love it when we find hikes like this, with so much packed into a short distance. You could always make it longer if you wanted by adding on another trail. 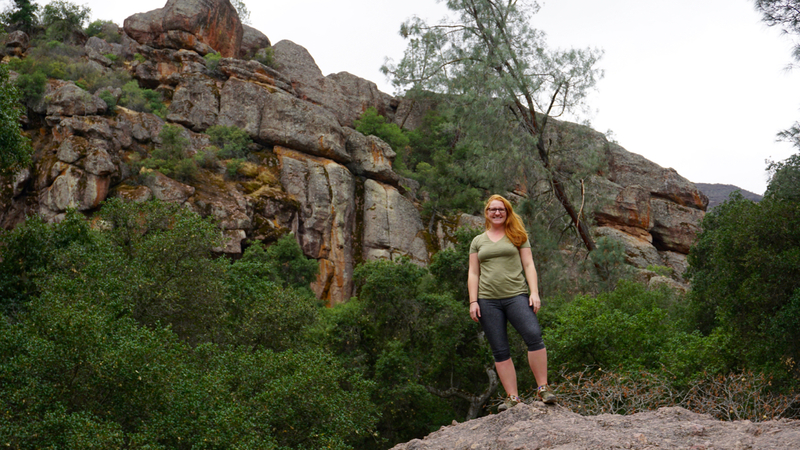 Pinnacles National Park was a really fun park because it seemed very undiscovered, but also had nice, new amenities. 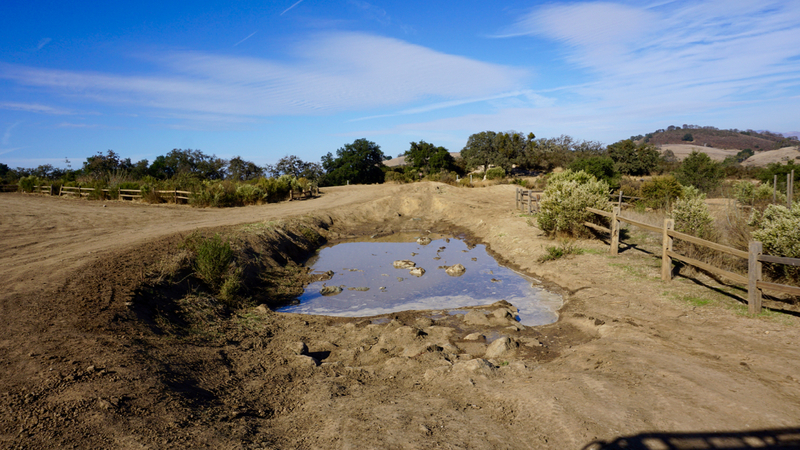 You could hike one of the most popular trails (like we did), yet encounter very few people, and also find a water fountain and bathroom with flush toilets at the trailhead. (For reference, most parks we go to only have pit toilets). 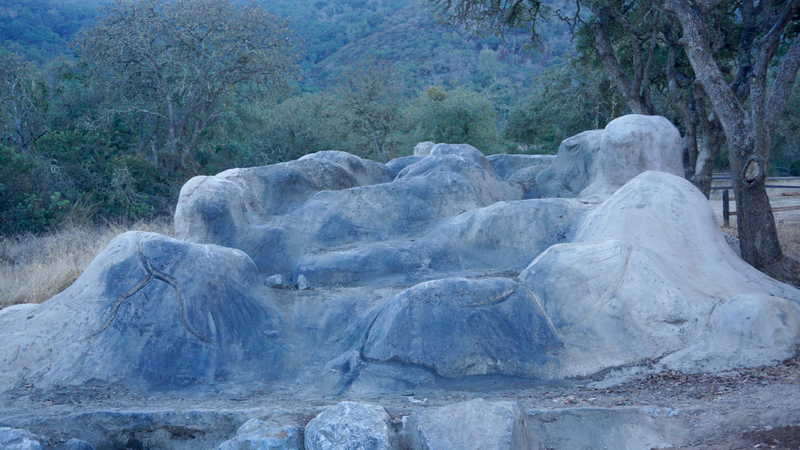 The park is also known for its unique wildlife, athough we didn’t see much of it. 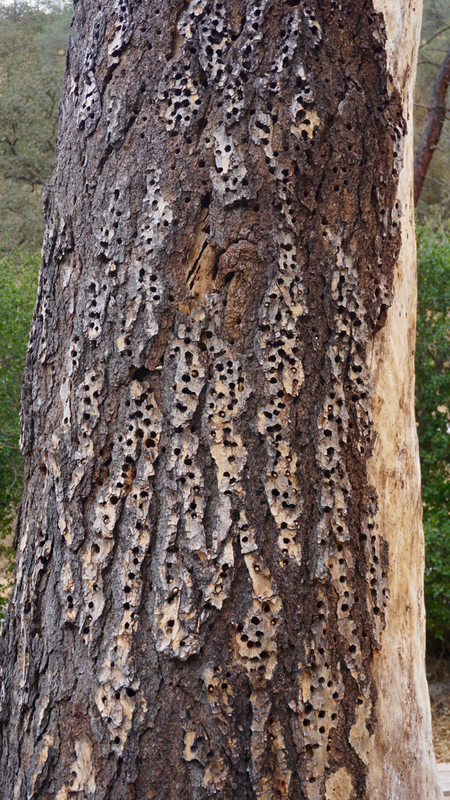 I mentioned the bats roosting in the caves, but this area is also home to around 400 different species of bees. That is the highest concentration of bee species in a single area in North America. 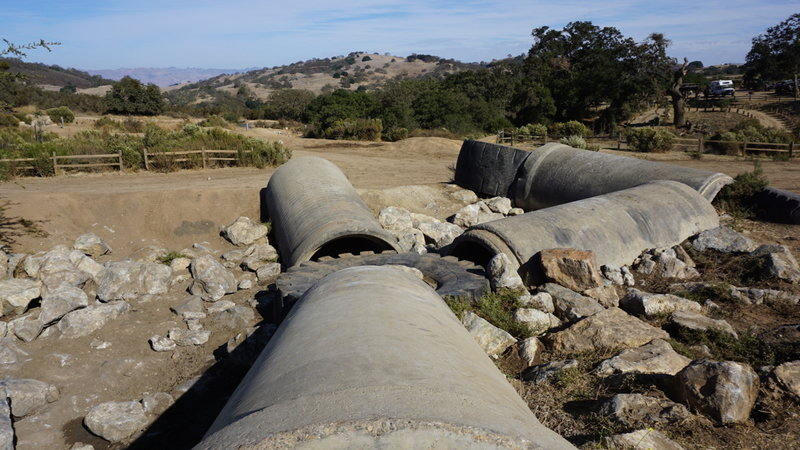 Most notably, the park is a nesting area for the endangered California Condor, one of the largest birds in North America. The meat-eating vulture can weigh up to 20 pounds and have a 9 foot wingspan. We might have been able to spot one cruising along the updrafts if it had not been so cloudy. I was hoping to see one, but maybe we’d already had our share of wildlife sightings for this stop. From here we’re driving south to the L.A. area to check a big box on my roadtrip bucket list: visit the Wizarding World of Harry Potter! Next Next post: The Wizarding World of Harry Potter! Great post Brandon. Love the video of the off road challenge.